Let’s check in on how Consumer Confidence and mortgage interest rates fared during August. The overall Consumer Confidence Index currently sits at 92.4, up 2 percent in a month, 13 percent from a year ago, and at its highest point since October 2007. At 94.6, the Present Situation Index increased 8 percent between July and August, and is up 33 percent from a year earlier. The Present Situation Index is currently up 368 percent from its December 2009 low point, and sits at its highest level since February 2008, but still down 32 percent from its pre-bust peak in July 2007. The Expectations Index fell slightly in August, down 1 percent from July, but up 2 percent from a year earlier. As of last week, the 30-year mortgage rate was at 4.10 percent, still virtually unchanged since late May. 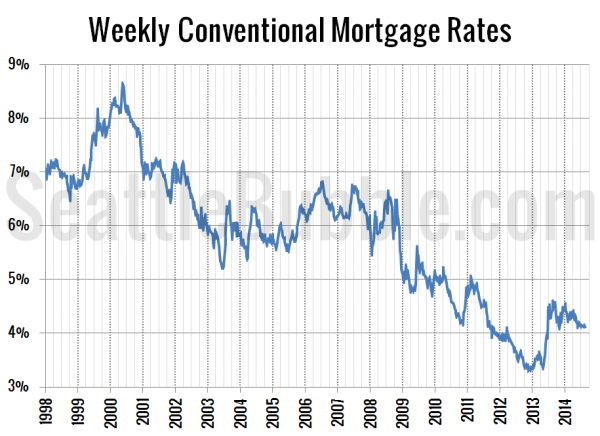 Current interest rates are roughly on par with where they were in August 2011 and nearly two and a half points below the 6.41 percent average rate during the height of the housing bubble through 2006. Poll: Ideally, what season of the year would you prefer to buy a home? The CCI was at 96.9 in January 2007. By November 2008 it was it was 55.5. 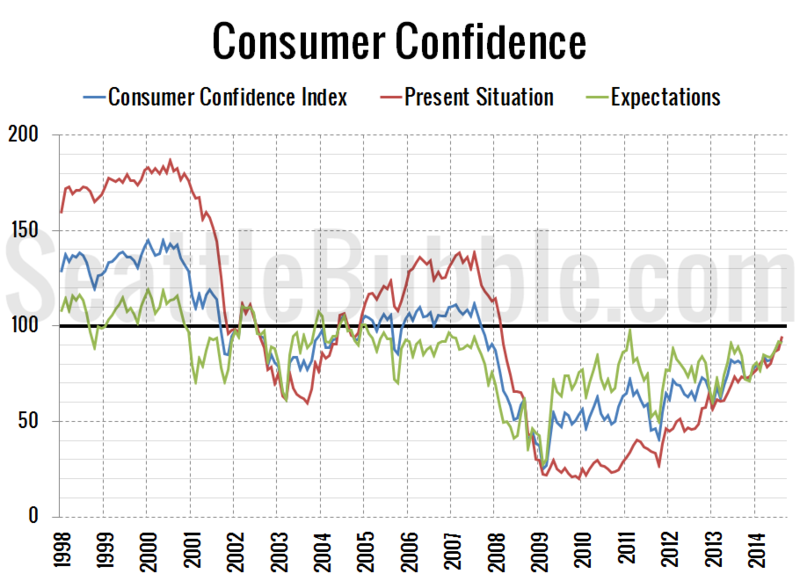 Consumer confidence has limited predictive capability. I’d rather read a round up of what asylum inmates are saying about the future. I’m not saying it would be any more valuable, just slightly more interesting. Speaking of which, softwareengineer must have lost his internet privileges or is undergoing a round of shock treatment. Maybe he’s on vacation in Kansas. I hear it’s lovely there this time of year. Hotel rooms are 16 dollars a night, but there’s no wifi.